“The Adventure of Nera” is a wonderful tale to tell or read on Samhain, and is one of my favorites. A few thoughts on it follow. The echtrae are the class of tales translated as `adventures’. They usually involve a trip into the Otherworld. These tales show some of the things, abilities and knowledge to be sought in the otherworld. They tend to be full of cups, cauldrons, glasses, wells, fountains and springs: containers for knowledge and wisdom. In Nera’s case the knowledge gained was life saving for his community. While often enough in the tales the otherworld comes knocking, in Nera’s case he went after it. At the Samhain feast of Medb and Ailill long long ago in Cruachan, Ailill the king promised great reward to any who would go out to the gallows and tie a willow withie (tie) onto the corpses of two executed criminals, dangling there on the night of dissolution of boundaries between worlds.. Only Nera was brave enough, or seemingly foolish enough. Through a long series of weird events, including giving one of the corpses a ride on his back in search of a drink and seeing a horrifying vision of his people’s hall lying ruined, and filled with corpses, due to an attack from a nearby fairy mound, Nera ended up inside said fairy mound. Once therein, he was accepted by the aes sid king who set him up with a woman whom would become his wife. The king also assigned him a daily task of bringing to the King’s house a bundle of firewood. As Nera brought the firewood to the court, he’d pass a spring where he was fascinated to see a blind man carrying a lame man coming out of the nearby court each morning and walking to the well. There the blind man would ask the lame man, “Is it there?” and the lame man would reply affirmatively. Nera, overcome with curiosity, rushed to his new home and wife. His wife was able to tell him that a gold diadem, the crown of Brion, was kept in the well—and that it was one of the three treasures of the island of Ireland. So often it is an otherworld woman who gives hidden knowledge to the journeyer. Nera then asked her about his ravaged household that he had seen that night he first came to the mound, and she told him what he saw had not yet happened, it was a vision of the future, of the Samhain a year hence, and that he could avert this from happening if he were to go and forewarn his comrades. How would they ever believe him, he mused but she said to take the fruits of summer with him as proof, namely, wild garlic, primroses and buttercups. She also confided that she was pregnant by him, and would bear a son. He must come and warn her before the following year’s raid, as she knew Ailill and Medb would raid the mound. So he went back and warned his people that Cruachan would be attacked the following Samhain. Ailill gave him a gold-hilted sword as a reward. And Nera told them about the diadem immersed in the waters of the spring. The king and queen began planning their raid. As the next Samhain approached, Nera went back to the sid and his otherworld wife. He was even indirectly connected to the events that trigger the Tain, as the Morrigan decided to take a cow that he gave to his young son, but that’s a tale for another time. Wells and springs are like cups and other vessels; they are containers, containers of knowledge, wisdom and healing. In this case, one of the three treasures of Ireland, a crown with associations of sovereignty is raided and delivered to this world. Nera proves to be an important intermediary, and a player in key events of his people due to his courageous echtra, but he joins those mortals who settle in the Otherworld and don’t return. We can imagine he is still happily there with his Otherworld wife. It’s said he will not come out until the end of the world. The “Echtrae Nera” is an excellent tale to read or tell during the Samhain season. The best translation is by John Carey and can be found in The Celtic Heroic Age, edited by John T. Koch. Or you can go to the Mary Jones Celtic Literature Collective site for it. 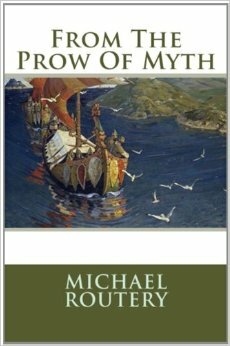 From The Prow Of Myth, a book of poetry by Michael Routery, is now available. You will find them all within the pages. As well as Hadrian, Julia Balbilla, Sappho, and many more! – gave me an even more serious case of shivers. … The poems in the final section rival some of the best ecopoetry. “When Birds Are Gods” and “Spring on Mt. Tamalpais” are particular favorites. I was surprised, though, at how much I enjoyed, and was affected by, the Celtic pieces; with the possible exception of Brigid, I have never felt particularly drawn to the Celtic Deities or their stories. Nonetheless, I was left goggle-eyed by some of the imagery of these pieces. –Rebecca Buchanan at Eternal Haunted Summer. –Neeli Cherkovski, author of Whitman’s Wild Children, Animal, and From the Canyon Outward. This collection of praise and invocatory poems is perfect for the devotional polytheist, the lover of nature poems, seekers of vision poetry, and all those admirers of Celtic and Hellenic myth. Available from the Vindos Press e-store: https://www.createspace.com/4443944! First off the term is a rubric that holds many multiple religions under its tattered umbrella. But it also is a useful adjective for aspects of many other religions or currents within them that don’t come under the umbrella. A number of bloggers these days promote the idea of something that is unified and is called Paganism, yet their boundaries exclude many, and often seem idiosyncratic. I can’t imagine how anyone for example could think Wicca and Asatru are two branches of the same religion. They are theologically, liturgically and ritually very different as well as having different ethical orientations. So why the pretense? After his survey, of various world paganisms, including Chinese folk religion, Shinto and Afro-diasporic traditions, he writes: “Among the features that emerge as noticeable are those of animism, pantheism, polytheism, immanentism, humanism, nature worship, numinousness, magic, organicism, fetishism, and idolatry. There is, however, no complete list of characteristics that can identify any specific practice as pagan. Most of the identities that we are permitted to recognize as pagan share in this pool, subscribing to some of its ingredients but not necessarily all of them.” He thinks the most constitutive ones are an attitude more this-worldly than transcendent and a recognition of divinity in matter, “whatever else it may be” (65). Toward the end of the book, after exploring world paganisms, descriptively, behaviorally and theologically he comes up with this definition: “Paganism is polymorphic not only in its determination but how it perceives the divine….in sum paganism, represents a celebration of variety that challenges the very limits of human conception and imagination” (158). Polymorphic is a particularly resonant term, I think, one that can well be kept in mind by polytheists. 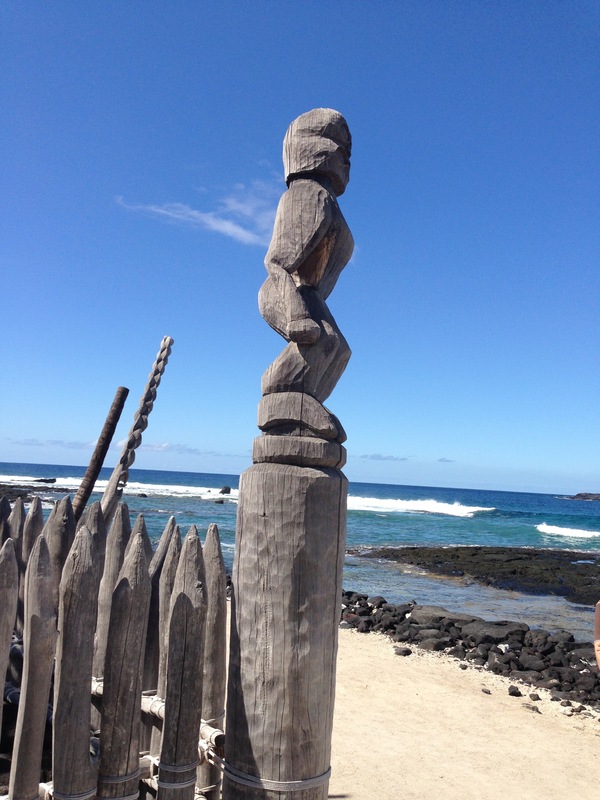 Deity image at Pu’uhonua O Honaunau, Hawaii. York also (following Albanese) makes an interesting observation of there being two ideal types of religions: the pagan and the gnostic, with the corollary that many formal religions contain both. There is much paganism in Roman Catholicism, with its feasts, processions, anointing of the statues of the saints and its veneration of holy sites. Hinduism contains both, and Plato (though, he was pragmatically pagan for the masses) was primarily a gnostic. While nominally pagan the Neoplatonists were transcendental gnostics in practice. In this York makes a useful terminology of generic and nominal paganisms. “Paganism is an affirmation of interactive and polymorphic sacred relationship by individual or community with the tangible, the sentient, and not empirical.” In this rewording, paganism is understood as endorsing the relationship between physical and supernatural realities as well as human (and possibly other forms of) consciousness. While these are broad and inclusive definitions, they are by no means a ‘just because you say you are’ definition. They allow much diversity but are distinguishable from transcendentalist orientation, typical of Abrahamic theologies, the New Age movement, and of Vedanta. Indeed, York sees four main religiosities worldwide: the pagan, the Abrahamic, the dharmic, and the secular. He has taken a certain amount of flack for his use of pagan for traditions that have eschewed the term as one imposed by westerners on them and pejoratively so, such as various practitioners of various American indigenous traditions, but it’s hard to see how any word for such a widespread religious inclination would be liked by all. Still something important to note. So we have a word that does mean something, but not in a hardened or ossifying way that allows no process or diversity.